The IEM Gyeonggi qualifier is the only notable tournament that uses the new patch 3.8 to this date. I have looked through the vods for the TvP match up, and there are some interesting trends. TvP is the match up that many considered to be least affected by the new patch. Although Blizzard are trying hard to make mech competitive in TvP, it is very unlikely to happen. There are too many variables that shape how bio is hands down favored in the match up, and it is extremely difficult to change that without breaking the game. It is difficult to adjust one unit or multiple units to make a huge change for a match up without affecting another match up. Is the Adept shade vision range going to change the early game? What is the role of Cyclone in the match up now? Does the new Dark Templar blink upgrade make a difference? Is the Warp Prism nerf too much? Will the Stargate units’ changes shape the late game? As I have mentioned previously, Adept is favored over Stalker in the early game because of its ability to scout. The decrease of vision range from 9 to 2 is huge, and it will definitely affect the information gathered by Protoss in the early game. While the change may seem crazy, it is understandable that Blizzard want to make a big enough change to observe the effect before adjusting the number backward accordingly. Intuitively, Stargate opening is considered to be the go-to choice, as it provides better scouting ability than other tech choices. However, I expect Protoss to favor Stargate opening for a short period of time, and then move back to the same few variations that we see before the patch (Stargate is still one of the three main options). Unsurprisingly, based on the IEM Gyeonggi qualifier games, about half of the builds are Stargate opening with Oracle into Phoenix. The classic Robotic Facility into Twilight Council is still popular though. The role of Cyclone has not changed as much as people have predicted in my opinion. I will discuss about this separately below. As far as the IEM Gyeonggi qualifier games go, I have not seen Shadow Stride being researched, and I will want to see how sOs plays this new patch. The community in general has nothing positive to say about the upgrade. I also think that the Warp Prism health nerf is reasonable, and it will not be noticeable at the higher level. The key is that the small health nerf helps to separate the better players from the rest. It is difficult to gauge how the new Tempest and Carrier change the late game. Based on what I have seen on reddit, it seems like Carrier is gaining traction. Neeb was actually using Carriers with Mothership to destroy Hydralisks. He is also the only one who I have seen using Void Ray in the main army in PvT (vs Top game 2). There are three main roles that Cyclone fills before the patch in TvP. The first is to use it in a one-based all-in (watch the video below). The second is to use it as a defensive option against Oracle and Warp Prism, and this is usually paired with a Viking. The third is basically to break the Pylon Overcharge attacks, and it is a better option than Tank in case opponent goes for Oracle follow up. This can be done with either 15/16 Reaper opening or 16/16 Marine opening into early expand. The early part of the build order is the same as the 2-1-1, but it is more accurate to call it a 1-1-1 in this case. This is because the key difference of the Cyclone version and the Tank version is the Tech Lab after the second Widow Mine. Since Cyclone does not require a Tech Lab on the Factory any more, you can produce Cyclone immediately after the second Widow Mine. Thus, the production does not halt with a Tech Lab building, so it is hard to squeeze the second Barracks in that is usually built at this timing. The idea is simple, you simply attack with everything (see images below), and rally your Factory for more Cyclone. 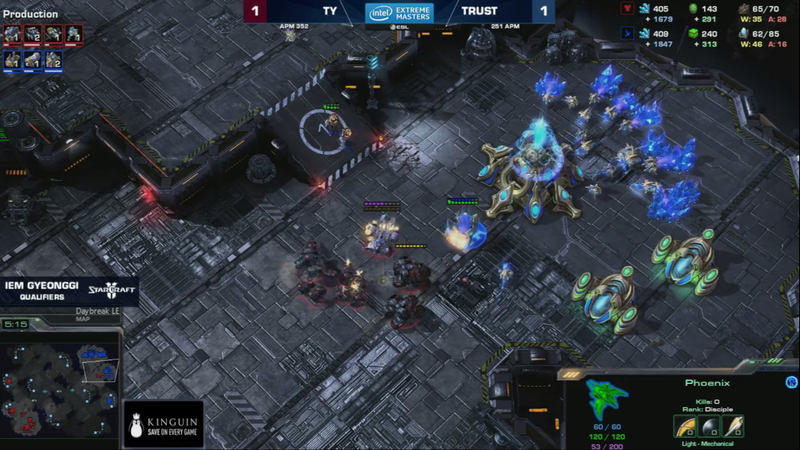 You can watch TY versus Trust (game 1 and 3), and INnoVation versus Hurricane (game 1). I believe Liberator is a better choice than Viking in general. I think TY picked Viking because of Trust’s Stargate build. Liberator will get picked away by the Phoenix, while Viking can still attack in assault mode. This does not mean that the previous Tank timing is no longer useful. In fact, INnoVation (vs. herO) was still using that in the IEM Gyeonggi qualifier. I initially thought that the difference could be due to the map, as Cyclone should be stronger on maps where the attacking location does not have a ramp. However, INnoVation was using Tank to attack the Protoss third on Vaani Station anyway, so the ramp should not be the main reason. Also, the preference of early third Command Centre versus standard additional Barracks should not matter. As mentioned earlier, the Cyclone version does not put down the second Barracks as early as the Tank version does, and TY put down the third Command Centre before additional Barracks when he used the Cyclone version. 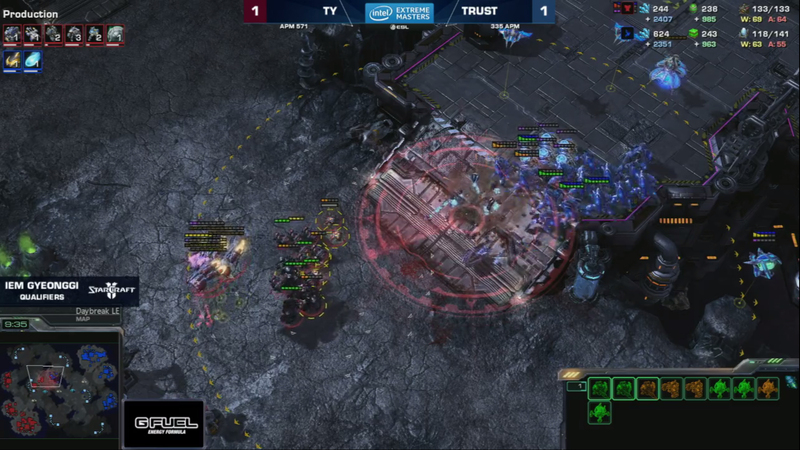 TY could have put down the second and third Barracks instead of the third Command Centre anyway, but it is clear that he favors an earlier third in TvP as you can see from his second game against Trust. I have been wondering if Cyclone can be included as part of the main bio army in TvP. Based on what TY did, it appears that he thinks Cyclone is a good counter against Stalker heavy army (see production tab in the image below). It is common that Terran produce Widow Mine from the Factory after reaching the 5-1-1 convergent point, and it is Terran’s answer against Adept and Zealot. 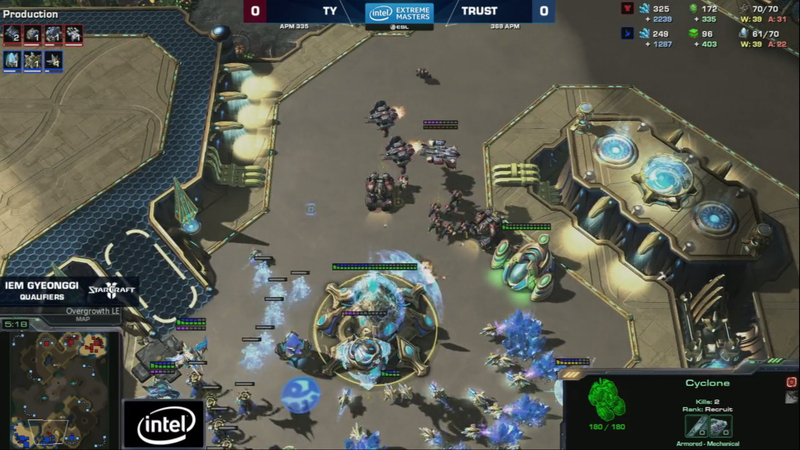 However, in game 3 of TY versus Trust, TY replaced his Widow Mine with Cyclone as a way to counter Trust’s Stalker heavy composition. Clearly, I do not know what TY was thinking, but I believe this is a plausible explanation. With that being said, I think Widow Mine is still effective against Stalkers if they are in range, but Cyclone allows Terran to be more proactive in the engagement. In my opinion, an effective way to include Cyclone as part of the army is to use it in a short time frame of 3-1-1 convergent point. I propose using a 3-1-1 of two Reactor Barracks, one Tech Lab Barracks, one Reactor Factory and one Reactor Starport. I have mentioned in my convergent point article that it is normal to move to a 3-1-1 then a 5-1-1 convergent point in every match up. The reason I emphasize on using Cyclone in 3-1-1 and not 5-1-1 is because of the resource, upgrade and composition considerations. I will explain these three factors below. It is a huge resource investment to keep producing Cyclone with Reactor, so it is difficult to have the resource to put down the fourth and fifth Barracks. Thus, you are more likely to sit on 3-1-1 longer than you normally do if you continue to produce Cyclone and include it in the main army. By the time you have the resource to have the 5-1-1 production structures with Cyclone production at 3-1-1 earlier, you should have +2/+2 infantry upgrade and Protoss should be more or less on par. Cyclone’s effectiveness is hugely affected by its upgrade difference (watch video below – time stamped), so it is not cost efficient to have Cyclone anymore at that point of time. Thus, once you have 5-1-1, you should go back to the normal TvP production without Cyclone. The purpose of the Cyclone in the main army composition is to counter Stalker with its bonus damage against armored units, and also to provide the meat shield for the Marines. These two purposes sort of overlap with Marauder, and hence, I think it is more effective to have two Reactor and one Tech Lab than usual one Reactor and two Tech Lab. The above 3-1-1 Cyclone idea is just my untested idea, so there is no professional vod on it. It is uncommon to produce with a Reactor Factory before you have a 5-1-1 set up, as bio is still the core of the army. Interestingly, INnoVation was doing this unorthodox 3-1-1 with Reactor Widow Mine, and I think his army composition is inferior to the standard approach. Widow Mine is meant to be a support unit, but the ratio of bio to support units is not well balanced when you produce Widow Mine with Reactor in 3-1-1. He did that in those TvP games that I have already linked earlier in this post. Another interesting observation is double Robotic Facility. Both Hurricane (vs. INnoVation game 1) and Neeb (vs. Top game 2) opened up with Stargate tech, and then produce Colossus with two Robotic Facilities. Double Robotic Facility itself is not exactly new, but the thought behind it is. The Terran players react by having a second Reactor Starport to produce Vikings to counter the Colossus. Subsequently, Protoss switched to Disruptor after producing no more than four Colossus, and the Vikings then become a poor tech choice for Terran. I attribute this to the success of ShoWTime’s triple aoe composition (Colossus, Disruptor and High Templar) against ByuN in Blizzcon (see vod above). Disruptor was momentarily considered as a poor choice in high level TvP, because Terran can micro against Disruptor to dodge the shots (watch video below). The mix of different Protoss aoe units complicates the Terran army control a lot, and this allows Disruptor to have a place in the match up other than early drop surprises. Therefore, since the composition goal is to have Disruptor, Colossus and High Templar, it is reasonable to have two Robotic Facilities. I’ve only recently come to this blog, though as soon as I did I devoured every post I could make time to read. Please continue to provide insight on the game post-patch, as I feel like a lot of players (myself included) aren’t really sure what to shoot for in the coming seasons. Personally, I’ll be keeping a close on the the IEM qualifiers and gobbling up every matchup they broadcast. Recently saw that Blizzard was already making multiplayer balance adjustments that are going to have what I assume is a major impact on the TvP matchup in particular if they are finalized. Anti-ground weapon minimum scan range updated to 6.5. Thermal Lance damage increased from 12 to 12 + 4 vs Light. Again, thank you for the time and effort you spend on this site. It’s appreciated. Update on the above: Seems BlizzRackle updated the situation on the balance change and removed the notes on the changes. It’s 404’ing now. Oh wow, Blizzard really are pushing it hard. I guess this gives me something to write about for the next post. Thank! But don’t worry about it, because I don’t run ads. The ads you see is generated by the wordpress, and the money doesn’t go to me. I know how annoying it is when you’ve ads and pop up, so I don’t do it.